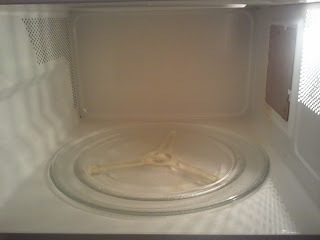 It is amazing how quickly food splatters build up in the microwave. Even if I cover the food, I swear it jumps out from under the cover and bounces around. 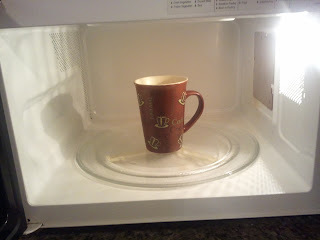 I have been using this method I think as long as I have owned a microwave. I try to give mine a quick weekly cleaning but sometimes it ends up being longer. I don't know why. It's one of the easiest appliances to clean. And it doesn't take anything special. In fact I bet you have what it takes in your kitchen already. Fill your coffee cup with water. Place it in center of microwave. Close the door. Turn microwave on for two minutes. Leave the cup in there while you are cleaning up the rest of the kitchen. 10-30 minutes should be long enough. If you have a removable tray wash it off in the sink and let it dry. Use your wet dish cloth and just wipe it out. All the stuck on gunk wipes right off with no scrubbing.